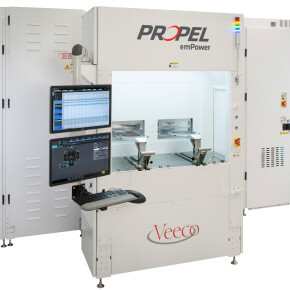 Veeco's new Propel® emPower™ GaN MOCVD system is designed specifically for the high-volume power electronics industry. Featuring a single-wafer reactor platform capable of processing eight- and twelve-inch wafers, the emPower system deposits high-quality GaN films that result in highly-efficient power electronic devices. Veeco’s proprietary TurboDisc®, IsoFlange™ and SymmHeat™ technologies ensure the new systems offer homogenous laminar flow and uniform temperature profile across the entire wafer, resulting in unmatched within-wafer uniformity. Additionally, they provide excellent run-to-run repeatability without requiring an in-situ cleaning step, resulting in high uptime with more than 150 runs between maintenance. Engineered to offer versatility, the systems can process six- and eight-inch wafers in single-wafer mode, as well as two- to four-inch wafers in mini-batch mode. The single-wafer reactor platform’s wide process window coupled with capacity scalability provides the most flexible solution in the industry today.